As much as I enjoyed this story, I got to the end feeling kind of meh. There were an awful lot of typo mistakes and when I find a typo, it's bad as I can usually overlook them. This was a 3.5 star read for me, and I would have given it a four but a lot of those typos were repeated throughout the book and that's just careless when multiple people read through these before they get published. 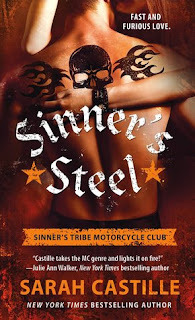 I loved Zane, but Evie took the entire book to come to grips with her shared history and acceptance of the biker lifestyle even though she had started dating a man she knew nothing about except he was a club president. Other than that, this is my kind of story. Love and loss with a second chance. A hot daddy. Bad dude bikers with big hearts and love for their women. Yes, even though there were the typos and Evie annoyed me at points, I'm looking forward to reading other books in this series when my library has them available. I really liked the war going on between the Sinner's and their rival club the Black Jacks, it really added a depth to the story that is sometimes missing. Evie having a relationship with the Black Jacks President made a lot of things more personal between the characters and I am anxious to see how the other couples in this series got together. There are some strong females that do what they want, regardless of the consequences from their alpha men. If you don't care about typos and this story sounds good, please read it. I'm hoping the first book in the series isn't as bad and the author/publisher just got rushed. Her chest expanded and she sucked in some badly needed air. This wasn’t Zane the teenager, who fumbled with her clothes beside the creek, his hand shaking as he touched her bare skin. This was Zane the man, confident, self-assured and strong, with a dominance that made her knees weak and a body that made her mouth water. Evie pulled away, putting some much-needed space between them. “The way I want to live includes having a way to pay the rent, and that’s not going down if anything happens to the shop. Plus, Axle won’t be back. I told Jagger, but he didn’t believe me. He was just delivering a message from someone.” She turned to the door, cringing at the reveal she hadn’t intended to make, but before she could step inside, Zane clamped a hand on her shoulder. I was provided with a copy of Sinner's Steel in exchange for my honest review. I understand typos, I do, and I usually try and overlook them, especially when it's just one or two. But when it's like one or two per sentence, that's just careless and almost rude, you know? Like they didn't read the book themselves because surely a writer would notice errors before submitting to publishing? Or maybe I'm just a brat, and know nothing of the writing world lol. I have read a lot of books with typos in them lately!!! And I hate when an ending leaves me meh. An overabundance of typos would bother me too especially in a published copy not just an advanced copy. Those should have been fixed. The plot seems decent enough so that is a bummer.